Paton Tanks has been manufacturing rain water tanks for over 30 years and has developed a reputation for making quality tanks that last the test of time. Attention to detail, finish and build quality are all important manufacturing goals set by the company. 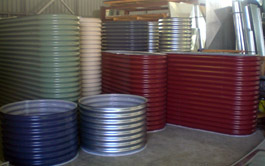 A Paton Tank will be the most reliable tank you will buy because of our long history in manufacturing rain water tanks. We know all the issues that can arise when trying to contain potable water and have developed a range of tanks that are reliable and will suit a wide variety of applications.